For other uses, see Japheth (disambiguation). Japheth /ˈdʒeɪfɛθ/ (Hebrew: יֶפֶת, Yefet; Greek: Ἰάφεθ Iapheth; Latin: Iafeth, Iapheth, Iaphethus, Iapetus), is one of the three sons of Noah in the Book of Genesis, where he plays a role in the story of Noah's drunkenness and the curse of Ham, and subsequently in the Table of Nations as the ancestor of the peoples of the Aegean, Anatolia, and elsewhere. In medieval and early modern European tradition he was considered to be the progenitor of European and, later, East Asian peoples. The meaning of the name Yafet/Yefet (יָפֶת or יֶפֶת) is disputable. There are two possible sources to the meaning of the name. From Aramaic root פתה, meaning to extend. In which case, the name would mean may He extend (Rashi). From Hebrew root יפה, meaning beauty. In which case, the name would mean beautiful. Japheth first appears in the Book of Genesis as one of the three sons of Noah, saved through the Ark. They are always in the order "Shem, Ham, and Japheth" when all three are listed (Genesis 5:32, 9:18 and 10:1), but Genesis 9:24 calls Ham the youngest, and Genesis 10:21 refers ambiguously to Shem as "brother of Japheth the elder," which could mean that either is the eldest. Most modern writers accept Shem-Ham-Japheth as reflecting birth order, but this is not always the case: Moses and Rachel also appear at the head of such lists despite explicit descriptions of them as younger siblings. Following the Flood he features in the story of Noah's drunkenness. Ham sees Noah drunk and naked in his tent and tells his brothers, who then cover their father with a cloak while avoiding the sight; when Noah awakes he curses Canaan, the son of Ham, and blesses Shem and Japheth: "Blessed be the Lord God of Shem and may Canaan be his slave; and may God enlarge Japheth and may he dwell in the tents of Shem, and may Canaan be his slave!” (Genesis 9:20-27). The Book of Genesis is the first of the five books of the Torah, that contains the account of Israel's origins as a people. Scholars increasingly see this as a product of the Achaemenid Empire (probably 450-350 BCE), although some would place its production in the Hellenistic period (333-164 BCE) or even the Hasmonean dynasty (140–37 BCE). The story of Japheth and his brothers may be even more recent: almost none of the persons, places and stories in the first eleven chapters of Genesis (called the primeval history) are ever mentioned anywhere else in the Bible, leading scholars to suppose that the history is a late composition, attached to Genesis to serve as an introduction to that book and to the Torah. 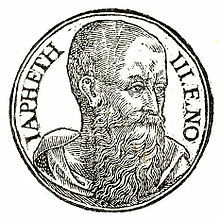 Japheth (in Hebrew, Yafet) is a transliteration of the Greek Iapetos, the ancestor of the Hellenic peoples. 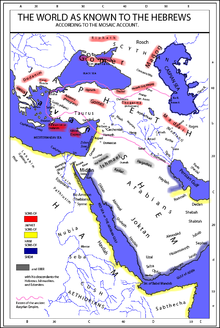 His sons and grandsons associate him with the geographic area of the eastern Mediterranean and Asia — Ionia/Javan, Rhodes/Rodanim, Cyprus/Kittim, and other points in the region of Greece and Asia Minor — approximating to one of the three kingdoms into which the generals of Alexander the Great divided his empire on his death (the descendants of Shem and Ham respectively correspond to the other two, those of the Ptolemies and Seleucids). As the point of the "blessing of Japheth" seems to be that Japheth (a Greek-descended people) and Shem (the Israelites) would rule jointly over Canaan (Palestine). From the 19th century until the late 20th century it was usual to see Japheth as a reference to the Philistines, who shared dominion over Canaan during the pre-monarchic and early monarchic period of Israel's history. This view accorded with earlier understanding of the origin of the Book of Genesis, which was seen as having been composed in stages beginning with the time of Solomon, when the Philistines still existed (they vanish from history after the Babylonian conquest of Canaan). However, Genesis 10:14 identifies their ancestor as Ham rather than Japheth. The world as known to the Hebrews (based on 1854 map). By these were the isles of the Gentiles divided in their lands. In the seventh century, Isidore of Seville published his noted history, in which he traces the origins of most of the nations of Europe back to Japheth. Scholars in almost every European nation continued to repeat and develop Saint Isidore's assertion of descent from Noah through Japheth into the nineteenth century. Ivane Javakhishvili associated Japheth's sons with certain ancient tribes, called Tubals (Tabals, Greek: Tibarenoi) and Meshechs (Meshekhs/Mosokhs, Greek: Moschoi), who they claim represent non-Indo-European and non-Semitic, possibly "Proto-Iberian" tribes of Asia Minor of the 3rd-1st millennia BC. In the Polish tradition of Sarmatism, the Sarmatians, an Iranic people, were said to be descended from Japheth, son of Noah, enabling the Polish nobility to imagine themselves able to trace their ancestry directly to Noah. In Scotland, histories tracing the Scottish people to Japheth were published as late as George Chalmers' well-received Caledonia, published in 3 volumes from 1807 to 1824. Japheth is not mentioned by name in the Qur'an but is referred to indirectly in the narrative of Noah (7:64, 10:73, 11:40, 23:27, 26:119). Muslim exegesis, however, names all of Noah's sons, and these include Japheth. In identifying Japheth's descendants, Muslim exegesis more-or-less agrees with the Biblical traditions. He is usually regarded as the ancestor of the Gog and Magog tribes, and, at times, of the Turks, Khazars, and Slavs. Some traditions narrated that 36 languages of the world could be traced back to Japheth. ^ Hunt 1990, p. 430. ^ "Japheth". Jewish Encyclopedia (1906). Retrieved 2017-07-21. ^ a b Haynes 2002, p. 204,269. ^ Garcia Martinez 2012, p. 33 fn.7. ^ Greenspahn 1994, p. 65. ^ Greifenhagen 2003, p. 206-207, 224 fn.49. ^ a b Day 2014, p. 39. ^ a b Glouberman 2012, p. 112. ^ Gmirkin 2006, p. 165 fn.192. ^ Day 2014, p. 38-39. Bremmer, Jan N. (2004). "Remember the Titans!". In Auffarth, Christoph; Stuckenbruck, Loren T. (eds.). The Fall of the Angels. BRILL. ISBN 9004126686. Day, John (2014). "Noah's Drunkenness, the Curse of Canaan". In Baer, David A.; Gordon, Robert P. (eds.). Leshon Limmudim: Essays on the Language and Literature of the Hebrew Bible in Honour of A.A. Macintosh. A&C Black. ISBN 9780567308238. Garcia Martinez, Florentino (2012). Between Philology and Theology: Contributions to the Study of Ancient Jewish Interpretation. BRILL. ISBN 9004243933. Glouberman, Mark (2012). The Raven, the Dove, and the Owl of Minerva: The Creation of Humankind in Athens and Jerusalem. University of Toronto Press. ISBN 9781442645059. Gmirkin, Russell (2006). Berossus and Genesis, Manetho and Exodus: Hellenistic Histories and the Date of the Pentateuch. Bloomsbury. ISBN 9780567134394. Greenspahn, Frederick E. (1994). When Brothers Dwell Together: The Preeminence of Younger Siblings in the Hebrew Bible. Oxford University Press. ISBN 9780195359558. Greifenhagen, Franz V. (2003). Egypt on the Pentateuch's Ideological Map. Bloomsbury. ISBN 9780567391360. Haynes, Stephen R. (2002). Noah's Curse: The Biblical Justification of American Slavery. Oxford University Press. ISBN 9780198032601. Hunt, Harry B., Jr. (1990). "Japheth". In Mills, Watson E.; Bullard, Roger Aubrey (eds.). Mercer Dictionary of the Bible. Mercer University Press. ISBN 9780865543737. Kvanvig, Helge (2011). Primeval History: Babylonian, Biblical, and Enochic: An Intertextual Reading. BRILL. ISBN 9004163808. Thompson, Thomas L.; Wajdenbaum, Philippe (2014). "Making Room for Japheth". In Thompson, Thomas L.; Wajdenbaum, Philippe (eds.). The Bible and Hellenism: Greek Influence on Jewish and Early Christian Literature. Routledge. ISBN 9781317544265. Wajbenbaum, Philippe (2016). "Genesis-Kings as a Platonic Epic". In Hjelm, Ingrid; Thompson, Thomas L. (eds.). Biblical Interpretation Beyond Historicity. Routledge. Wikimedia Commons has media related to Japheth. "Japheth" . Encyclopædia Britannica. 15 (11th ed.). 1911.